Poitou donkeys are dark brown or black. They also have a white underbelly, nose, and rings around their eyes. They are well known for their distinctive coat that hangs in long cords. Their shaggy coat is called acadanette, and is actually long soft hair that tangles and mats easily. 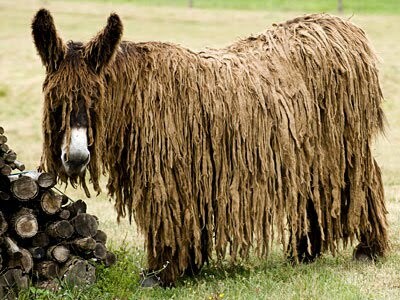 Breeders originally prized the cadanettes, but today most breeders or owners of Poitou Donkeys shear them, because it is difficult to keep their long locks clean. The Poitou breed is thought to have been established in France in 1884 when a studbook for the breed was established. In the 19th and early 20th centuries the Poitou were also used to help create other donkey breeds in America such as the American Mammoth Jack. During the mechanization of farms in the 19th and 20th centuries, donkeys declined in number and popularity and by 1977 reached an all-time low population. In 1996, the Hamilton Rare Breeds Foundation was founded in Vermont. There Poitou donkeys were bred and as of 2004, 26 purebred and 14 partbred Poitous were recorded, making this foundation the largest Poitou population in the United States, and the second largest in the world next to France’s government sponsored efforts to preserve the Poitou breed. Conservation efforts continue today and techniques for using cryopreservation to develop asperm bankfor Poitou donkeys has been developed to help restore the Poitou breed.